Foxcity – Close up on me ! 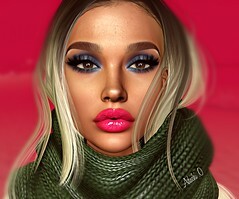 Hair : DOUX – Snob – Fades Pack . By Javiersasoo/By David Cooper (dam1710) NEW!!! – Extra colors and HUD ONLY IN FATPACK!!! Shoes : KC COUTURE – Giada Heels – with Hud!!!. By Klari55a NEW!!! Poses : FOXCITY – Bananas Agency Bento Set. – Greedy Pack. By Satomi Masukami @ SANARAE EVENT 6/26 – 7/17 NEW !! Props : FOXCITY. Photo Booth – Plastic Jungle (With Booth) .By Satomi Masukami @ SANARAE EVENT 6/26 – 7/17 NEW !! Swimsuit : KC COUTURE – Raya – with 50 colors + 15 Patterns Hud!!!. By Klari55a NEW!!! Hair : DOUX – Kimmy – Fades Pack . By Javiersasoo/By David Cooper (dam1710) NEW!!! • All items contains the HUD with some options.